RRMM Architects worked with Ferguson to draft the plans for the Ferguson Showroom in Naples, Florida that won an Innovative Showroom Award in the category of Multi-Location Retail Showroom Large. The award is from the Kitchen & Bath Industry Show (KBIS), the largest kitchen and bath show in North America. Another Showroom that RRMM worked with Ferguson on, located in Mesa, Arizona, was a finalist in the same category. This year’s show is being held January 9-11 in Orlando, Florida. Winners were announced yesterday evening at an awards ceremony. According to KBIS, the Innovate Showroom Awards recognize showrooms in the kitchen and bath space that “do a great job of engagement, creating an unforgettable experience, and educating their customers.” Showrooms are judged on their innovative, unique, and interactive showroom design. Positioned in the emerging Design District of downtown Naples, this award-winning Ferguson showroom features the latest lighting trends, chic and functional kitchen appliances, and state-of-the-art bathroom fixtures in an area that’s becoming the principal destination for a complete high-end shopping experience. An LED lighting lab allows associates to demonstrate how different light temperatures can change the look of an area. This space not only helps customers visualize and experience what the different types of lighting will look like in their own spaces, it also doubles as a conference room that interior designers and contractors can reserve for meetings with their clients. 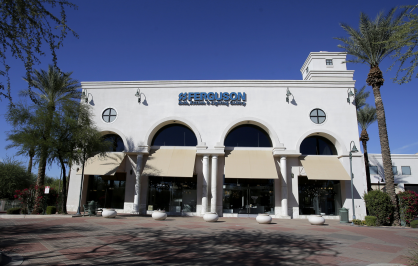 The Mesa, Arizona Ferguson showroom, located in a popular destination for culinary enthusiasts, features ten working kitchens in contrast to the one or two working kitchens that most showrooms offer. The multitude of kitchens create the perfect opportunity for professional chefs and homeowners to prepare a dish and try out newer cooking technology such as induction stovetops or steam ovens. The showroom also offers seamless integration of plumbing and light fixtures grouped together by style and trend. This, along with interactive displays like a shower wall with multiple options and an LED lighting lab, help customers easily visualize how various fixtures can be incorporated into their own projects. This showroom was a finalist for the Innovative Showroom Award in the category of Multi-Location Retail Showroom Large. The People’s Choice Award will be determined by the public following a week-long Facebook voting event held January 22-26, 2018. Ferguson is a top-rated wholesale supplier of commercial and residential plumbing supplies and a diverse distributor spanning multiple businesses such as HVAC/R, waterworks and industrial. In the past 64 years, Ferguson has grown from a local distributor to a $15 billion dollar company with more than 1,400 locations and over 24,000 associates nationwide. They are the largest distributor of plumbing supplies, PVF, waterworks and fire and fabrication products. They are the third largest distributor of industrial and HVAC/R products.